Open Jaws, Fuel Dumps and Hidden Cities… Oh My! 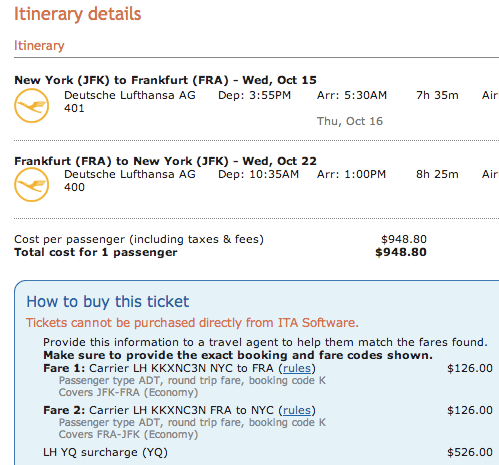 A few days ago I shared a great trick to remove certain fuel surcharges when using Aeroplan miles to fly from the US or Canada to Europe on Lufthansa. If you are a fairly astute reader, you would have also noticed that certain applications of the same trick can be very useful when it comes to paid fares. Thanks to the trans-atlantic metal-neutral joint venture within the Star Alliance, you can also book United flights under a Lufthansa codeshare if you are looking for a nonstop flight to/from cities other than Frankfurt or Munich. Since you guys liked the last post so much, let’s see what I’m talking about. Since we’re talking paid fares, let’s look at economy class for the time being (which is what most mileage running is all about… unless you’re one of the lucky few heading to Seoul for $1700 in GlobalFirst). We’ve already established than an open jaw saves a few hundred in fuel surcharge compared to a normal round trip, so let’s see what this looks like in practice. Let’s take a look at a “simple” open jaw first. Not a bad saving at all, especially for the West Coast. Over $250 is saved on this round trip with a simple open jaw, but this time you route back via your home city. This is a form of hidden city ticketing, where you simply throw away the last leg. I’ve also included a clever airport switch here so you can claim your bags too, if you plan to check any. So if you live in a city with more than one airport- take note! Back when I first introduced fuel dumping on Aeroplan I talked about the difference between Aeroplan and paid fuel dumps. Paid fuel dumps have two variables – the base fare and the fuel surcharge, where Aeroplan dumps only have the surcharge variable. 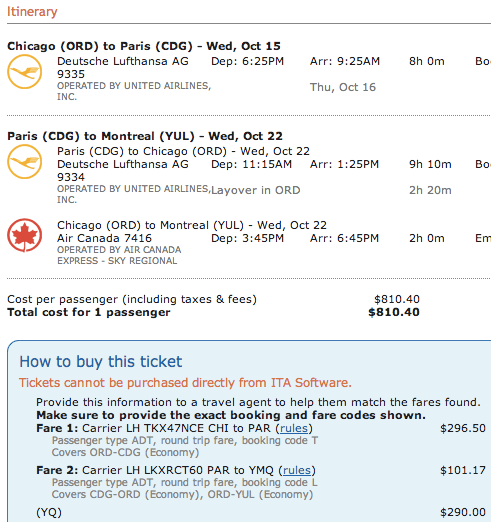 So what if you could simultaneously reduce both the base fare and the surcharge? 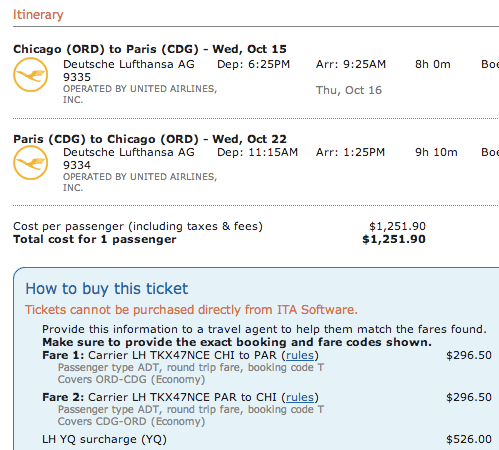 Suppose this time, I’m looking for a round trip from Chicago to Paris. Not only has the fuel surcharge dropped by $250, but the base fare drops by another $250, for a net saving of $450. Still not a rate that I would jump for joy at, but neat improvement, you’d agree, no? I hope you’ve enjoyed this post and can put some of these tricks to good use. Of course it’s always a better idea to have a stash of miles tucked away for these sorts of trips, so consider if you haven’t already the American Express Aeroplan Gold Card before the limited-time offer of 30,000 bonus miles expires. Thanks for your support as always, and as they say in my beloved Lufthansa FCT, “Gute Reise”! I guess this would only work if you only had carry-on luggage since checked baggage would be checked through to the destination? @Bob – All the transits mentioned in the post are thru US airports. Whenever you land at a US airport from an international flight (except Canada), you will have to clear customs first. So you will get your bags back (even though they are tagged all the way thru). There is a baggage drop area after clearing customs for connecting passengers. If your ultimate destination is in the US, then you don’t drop the bag back and simply walk out of the airport or to your next flight. Yep. Applies to Canadian airports as well where you must pick up and recheck bags. When you buy a FD ticket, can you check-in your flight and baggages in the airport normally? Yes, as long as you’re not utilizing a throwaway. Do you get miles for the flights before the last leg? I don’t think you can? Not unless you actually fly it. Pretty neat.. I was in the process of checking out fares from Boston to London and this shaved off a significant chunk..
How do you put the information in ITA for the open jaw? Do you just put in CDG-YUL and look for the one that goes through ORD? Or multi-city on the first page? Is there an advanced routing code to specify a specific layover city? Yes, there are advanced ITA codes. just type ORD in the advanced routing box to specify one connection via Chicago only. Glad to hear you enjoyed the post – it should work for all destinations in Europe when booked under a Lufthansa code. 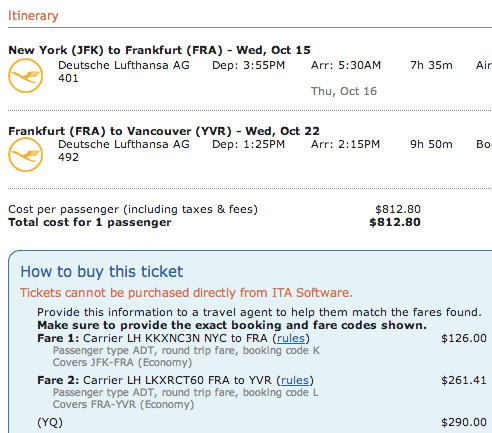 How would i identify or only include flights with a Lufthansa code? Just find it on ITA, using LH for the over-water leg. You can book on hipmunk. You can read up on advanced routing codes on ITA, but basically if you specify the citi(es) of transit, ITA will calculate the cheapest route on LH or any other airline. Great post Jeff! Can’t wait to play around with this. Does it work for flights to Asia? I work as a travel agent here in Australia, and although I know what fuel dumping and triple strike are, if we attempt anything along those lines, the airline will hit us with a sizable ADM (agency debit memo) ie. a fine. They’re well aware of this ‘glitch’. Thanks for the kind words and for pointing out the broken link! There was another fuel surcharge reduction for Air Canada open jaws that I previously blogged out along with the Lufthansa one. 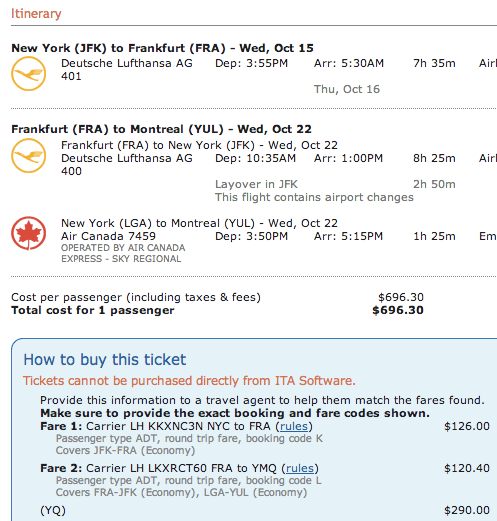 If you’re flying ex-YYZ to Europe check out Swiss (via Montreal) if you can book last-minute enough (typically under 7 days). Otherwise Brussels or United might have to be the way to go. are you kidding me, you post this publicly?? ?